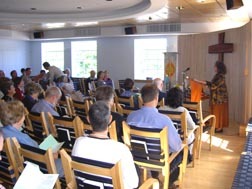 A bright space with windows to the north and east, the sanctuary will seat up to 100. The room has hardwood floors and a complementary wood ceiling, and is equipped with a flexible audio-visual system that can support drama as well as panel discussions. A perfect place for worship, songfests and dances. The sanctuary can be opened to include the skylight room, which is designed to be used as a stage. Together, these rooms will accommodate up to 120 for larger gatherings. Located next to the sanctuary, this space is open to the main entry hall and has easy access to the smaller dining room in the kitchen, and wonderful skylights above. A great space for meeting around tables. Located in the historic residence at the rear of the building, this fully equipped kitchen includes a small dining area with seating for 24. It opens onto the main entry hall and has easy access to the skylight room adjacent to the sanctuary. 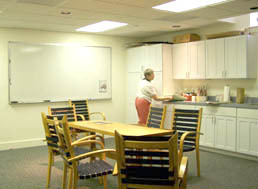 A great space for small working groups that need kitchen access. Combined, the sanctuary, skylight room and kitchen offer space for celebratory meals for up to 100 or other activities for 120. This large, well-lighted room on the street level of the building, with easy access from Carroll Street, will accommodate 48 people at tables or up to 60 seated theater-style. It is equipped for meetings, with two whiteboards and a ceiling-mounted projector for use with a laptop. A sink and counter-top support art projects. This large room can be divided into two smaller meeting rooms by a movable wall. This unique room, with a curved wall highlighted by translucent glass block, is located on the street level, with easy access from Carroll Street. It has a carpeted floor and is equipped with children’s furniture. 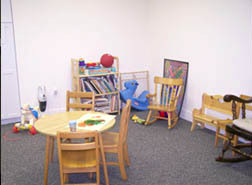 Excellent indoor play space for young children, and an appropriate place for younger members of families attending an event elsewhere in the building. This room opens on Carroll Street, and has gallery lighting to encourage art display. 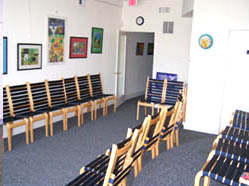 It features a small stage and can seat up to 24 for a musical presentation. A fine space for art exhibitions, informal folk concerts, or receptions.